In the market for new guitar strings? If you are an avid, practicing guitar player, you are probably in this position pretty frequently. With guitars, the strings do of course need to be changed regularly. This means you will have to seek them out and purchase them on occasion. If you are new to purchasing guitar strings, or if you just haven’t found the brand for you, this is the guide you need. First let’s discuss how we will be rating our favorite guitar strings, so you know what you should be looking at when you purchase some. For our reviews, we value nothing more than being as honest and accurate as possible. To make sure that this is an exceptionally trustworthy review, there are a few additional steps we take in our research. We read and research customer reviews and testimonials thoroughly. This allows us to get a broader view of what the general public thought of a specific product, and also lets us see any potential widespread issues that may be occurring. Researching each product thoroughly and ensuring that we know every detail about the product specifications and extra features is part of our process as well. That way you are not surprised at all when you receive your product, because you received all the important information beforehand. Lastly, we make sure to consider the reputation of the company who manufactures the specific product. It is important to many customers that they are purchasing products from companies they can stand behind and trust. For this particular review, we will be reviewing a few specific aspects for the best guitar strings on the market. Comfort, pricing, overall quality, coatings, and sound will all be qualities that we look at for these top 7 best guitar string choices. The first set of strings on our list are from Ernie Ball. They are one of the best-known brands for strings designed for nickel-wound electric guitars, and have been making them for quite a while. These strings provide you with incredible tone for a price that almost seems too low. They are powerful and sound absolutely amazing on your guitar. The gauge runs from .05 to .105, making them a perfect middle thickness that keeps them extremely easy to pluck strum, and play. The round-wound, nickel-plated wires surround an excellent, innovative high carbon steel hex core, which gives each strings extra resilience. Ernie Ball has been making strings this way for over 50 years, and it has proved to be a tried and true formula for the best guitar strings. The company’s strings are produced in the United States, and they only use materials of the highest quality. Ernie Ball strings are also packaged in very protective material that will ensure that natural elements won’t harm them. Want to purchase a set of these? They are available on Amazon for only $17.00. 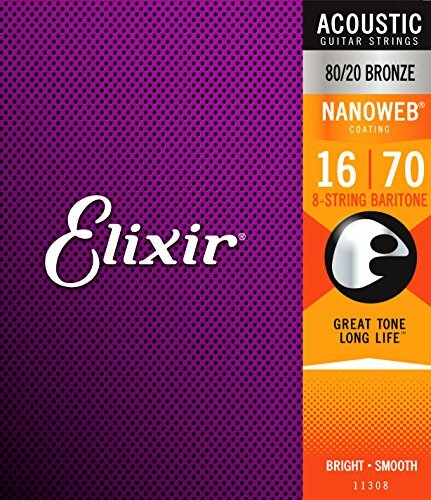 Next on our list we have the Elixir 80/20 Bronze Nanoweb guitar strings. Elixir is another brand that you should definitely have at the top of your list of possibilities for new guitar strings. Their products offer a shiny nanoweb coating that is said to give you three times the life of normal, non-coated guitar strings. The company has essentially done is create a very flexible, nylon-feeling, plastic coating to cover their wound strings with effectively. To make this revolutionary finished product, they dip the strings in the nanoweb coating to get it on there thoroughly. Doing this makes them much easier on the guitar player’s fingers, and it also protects the metal of the string from natural, environmental effects that will destroy the sound quality over time and shorten the lifespan of the strings. The 80/20 strings have an amazing, well-rounded sound that is bright and lovely to listen to. It is not particularly warm however, if that is what you are looking for in your new guitar strings. If you think these are the best guitar strings on our list and want to purchase a set, you can find them on Amazon for only $19.99. 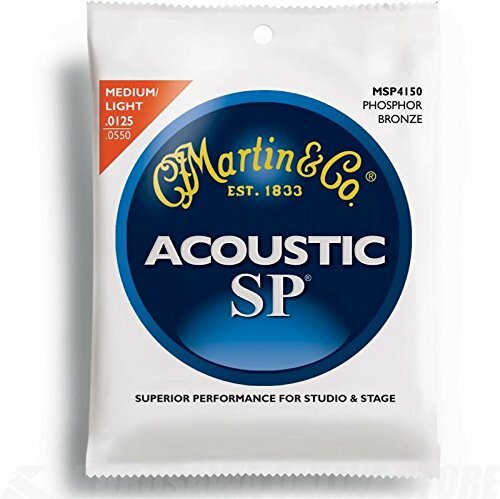 The Martin SP Phosphor Bronze acoustic guitar strings can’t really be beaten when it comes to price. These strings are all-around high quality, no matter what kind of guitar you have or music you are playing. Martin is probably a familiar brand name to you, as it should be – this company has been making gorgeous, handmade guitars and products since the very early 19th century (they started in 1833 to be exact). Their products have always been of the highest quality, and for over 180 years too. The gauges for this particular set of strings range from .0125 to .055, making them the perfect option for playing an acoustic guitar. You will have a full, well-rounded sound and enough resistance for any type of picking and playing. The core of these particular strings is a solid steel wire, and they have a warm Phosphor Bronze outer coating, giving them a beautiful acoustic sound. Want to purchase a set of these? They are only $8.49 on Amazon. DR is a brand that offers an extremely high quality product, without any frills or extras. Their strings are handmade in the United States, and are made from products from the U.S. as well. 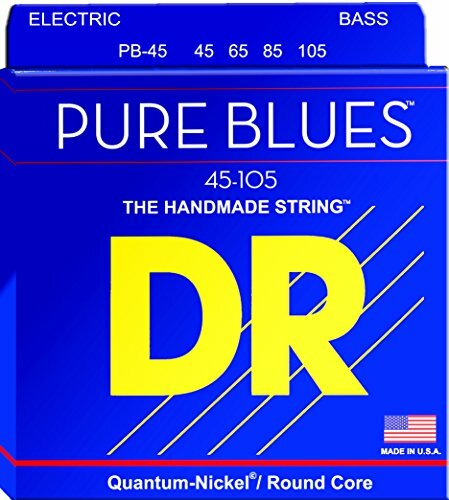 The Pure Blues strings are said to be able to sustain anything and last an incredibly long time. They are constructed incredibly well and wound in nickel for additional durability. Having the strings nickel-wound, you get a warm, full sound with an extremely bright quality that you don’t find in a lot of other brands. They are durable, sound great, and have a great quality – what more could you ask for in the best set of guitar strings? If you want to buy a set of these for your own guitar, you can get them on Amazon for $5.36. 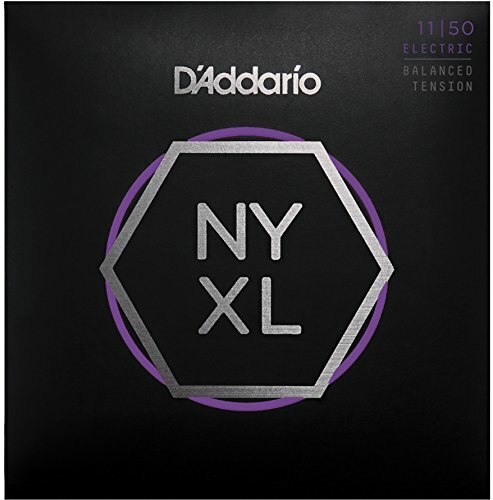 Next up, we have the incredibly innovative company D’Addario, and their NYXL Balanced Tension Strings. This company has worked over years to advance the technology and quality of electric guitar strings, and this product is their final result. 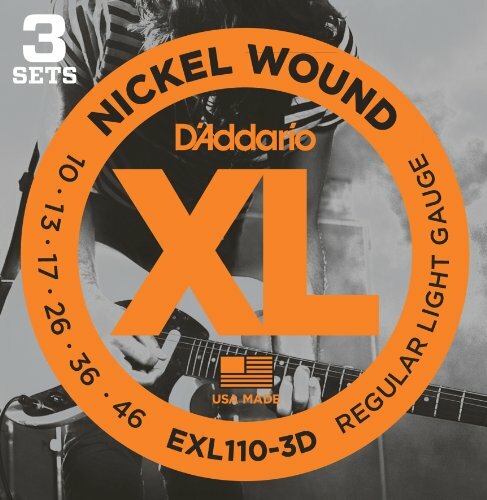 D’Addario worked with New York steel manufacturers to make a custom blend of NYXL steel that is said to be way more durable and high quality. They are able to be play vigorously and even violently without worrying about them breaking on you. They also have a fantastic balanced tension. So the gauge set you are given is perfect for strumming, plucking, and/or barring chords without any issues. The gauges are .010, .0135, .017, .025, .034, and .046. Lastly, the packaging that these strings come in is eco-friendly and resistant to any corrosion. If you are interested in purchasing a set of these, you can get them on Amazon for only $12.99. While Ernie Ball is a newer company when it comes to creating high quality acoustic strings, the Ernie Ball Earthwood Guitar Strings are a fantastic choice for any guitar player. These strings are made in California, and feature the most high quality, fresh materials available. They consist of 92% copper, 0.3% phosphorus wire, and 7.7% tin. 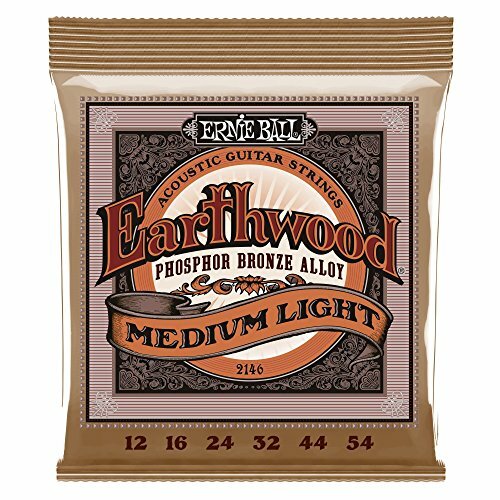 The packaging that they Earthwood strings come with Element Shield Packaging, which is said to prolong the string life and keep them fresh. Their phosphor bronze set has an amazing clarity to its sound, the warm tone also having a bit of bite to it. These strings are also medium-light gauge, meaning that they are the perfect balance for playing an acoustic guitar. 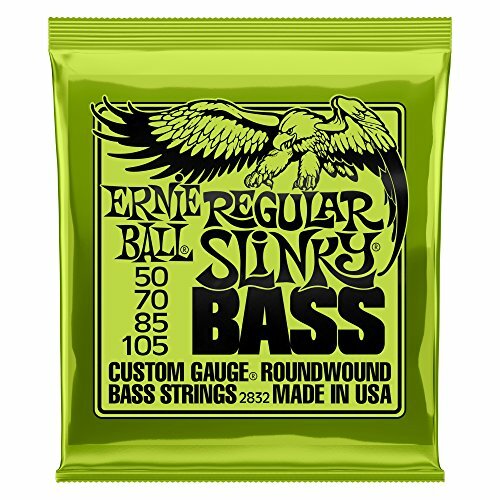 Ernie Ball says that many famous musicians also use this newer string, including John Mayer and Paul McCartney. That’s definitely a great selling point. If you are interested in purchasing these strings, a pack of them costs $5.79 on Amazon. Last, but certainly not least, we have one last guitar string option from D’Addario. They have many incredibly options for guitar strings, both electric and acoustic. The EXL110 Nickel Wound Strings are fantastic for electric guitars and are actually the brands most sold product. The strings have a bright, shimmering tone that is created by the nickel-plated steel used to make up this set. They are extremely high quality, even more so for how little you will have to pay to purchase them. For this particular set, the electric gauge is pretty light, with thicknesses ranging from .010 to .046. These strings are also packaged and stored in a corrosion-resistant bag to make sure they are fresh when you receive them. Want to purchase these awesome guitar strings? They are on Amazon for only $5.76. 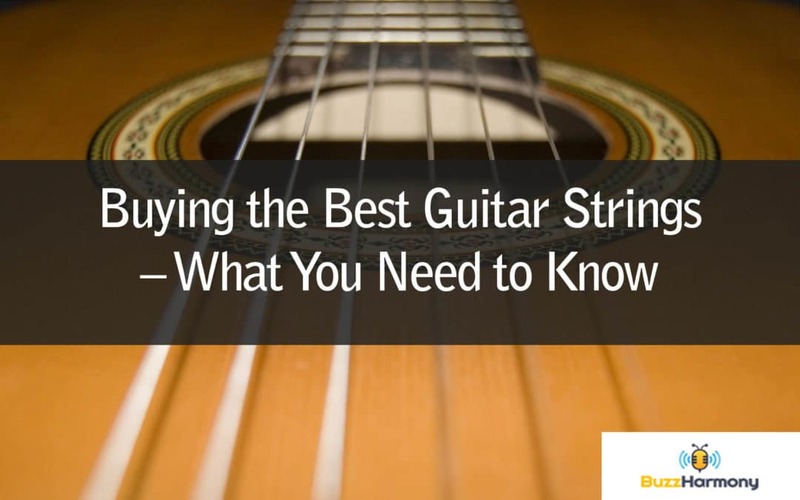 Now that you have seen our top choices for the best guitar strings on the market, let’s discuss the qualities and features you should look for when shopping for them. You should first consider your budget for purchasing guitar strings. While these are all fairly affordable, you will have to continuously purpose them while regularly playing your guitar. Make sure you know what you are willing to spend, as well as how long they will last. This will save you money and time in the long run, and it will make your choice much easier. Another thing to consider is what kind of music you will playing, as well as the type of guitar you will be playing on. 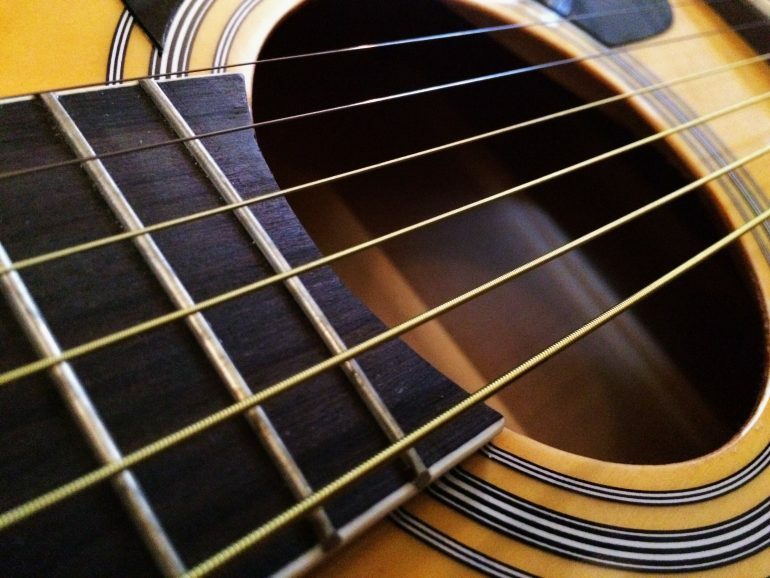 Whether you play an electric or acoustic guitar will drastically change the types of strings you should consider. The same goes for whether you are playing rigorous bluegrass music or slower, gentler genres of music. These aspects are all demand a certain quality and durability of guitar string, and its very important to keep in mind. Lastly, make sure to think about what you yourself look for in a set of guitar strings. Do you want a warmer tone? What qualities do you want to come out in the music you play? Consider what the guitar sound means to you and what it should emulate when you play, and it will also make your decision much easier. We hope that this list of our best guitar string choices was helpful to you. While it can be difficult to sift through different brands and designs and materials, it will definitely be worth it when your guitar makes the sound you’re looking for. If you had to choose a favorite guitar string set on this list, which one would it be? If you have not tried any yet, which one would you be most likely to purchase?